Manila Water's website hacked by Blackrain ! 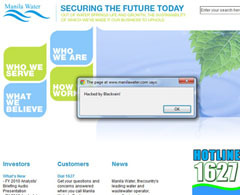 The website of water concessionaire Manila Water was hacked early Sunday, with visitors to the site seeing a small window indicating the breach. "Hacked by Blackrain!" read the message on the smaller window, which pops up when one logs on to the Manila Water site. Users could not access any part of the website until they click on the "Ok" button on the popup window. But aside from the popup, the other parts of the site appeared normal. Manila Water is one of two concessionaires of the Metropolitan Waterworks and Sewerage System, along with Maynilad Water.